A recurring acne problem can be very stressful, no matter what age or status, having to deal with acne can really take a toll on you emotionally. My days are often filled with heavy work load, from beating deadlines to meeting with clients. But it’s not as if I can postpone or cancel a meeting when I suddenly have a pimple on my face that is noticeable. Even if I try to hide it with make-up, knowing that my client sees that big fat zit on my face definitely lowers my confidence. The thing is, with my sensitive skin, I cannot just try every acne-removing cream that is out on the market. I’m afraid that with the wrong cream, my problem will only get worse. The good news is my acne problem would soon be over. The easiest way to prevent acne is now within reach. Proactiv Solution, America’s #1 anti acne solution is now exclusively available at Watsons and SM Department Stores nationwide. Developed by two leading Stanford-trained dermatologists, Dr. Kathy Fields and Dr. Katie Rodan, Proactiv Solution is a safe and effective system that heals whatever blemishes you currently have and prevent future breakouts. This Combination Therapy system is the first in the world, and is available locally at the following SRPs: 30-day Kit: Php 2,495, 60-day Kit: Php 3,995. 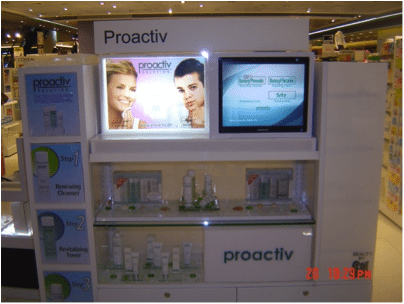 Proactiv is readily available at all Watsons and SM Department Stores nationwide. Visit the branch nearest you and ask about Proactiv. There’s also a 3 day nationwide sale at all Watsons branches from May13-15, 2011. Be sure to check it out and I’m sure you’ll get a great deal. And have I mentioned that Proactiv comes with a money-back guarantee? An amazing deal if you ask me. So what are you waiting for? Visit any Watsons or SM Department Store nationwide and end all your acne problems with your own Proactiv Solution. Are their products only for acne problems? Do they have something for normal skin type? i think i’ve seen this on tv, in a shopping tv. is this really true? my friend from AU is using proactie, effective daw. ni-recommend sakin, pareho kasi kami oily face. i will visit their branch in SM taytay. oh i hate acne!!! its been months since thelast time i had my facial..
pag substantial na income ko, mag invest talaga ako sa product na to.